Receive a $500 gear voucher and 5% off the walk when booking the Classic Larapinta Trek in Comfort before 28 February 2019! If you’ve been thinking about experiencing the Larapinta Trail with Australian Walking Holidays, now is a great time to make it happen. 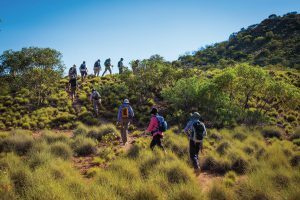 Walkers on the Classic Larapinta Trek In Comfort who book before 28 February 2019, will receive a $500 gear voucher from Wild Earth PLUS save 5% off the walk. This epic deal is available for travel at any time during the 2019 season, from 1 April – 30 September. This offer is subject to availability. For full terms and conditions click here.